Adrenal glands are a type of endocrine gland that is triangle-shaped and located on top of the kidneys. These glands release hormones that can have an effect on a wide variety of body processes and can influence behavior. The word adrenal comes from the Latin ad meaning "near" and Renes meaning "kidney." The adrenal glands are part of the body's endocrine system which is composed of a system of glands that release chemical messengers called hormones. These hormones are carried through the bloodstream to specific tissues and organs. The outer part of the adrenal glands is known as the cortex and releases hormones including testosterone and cortisol. 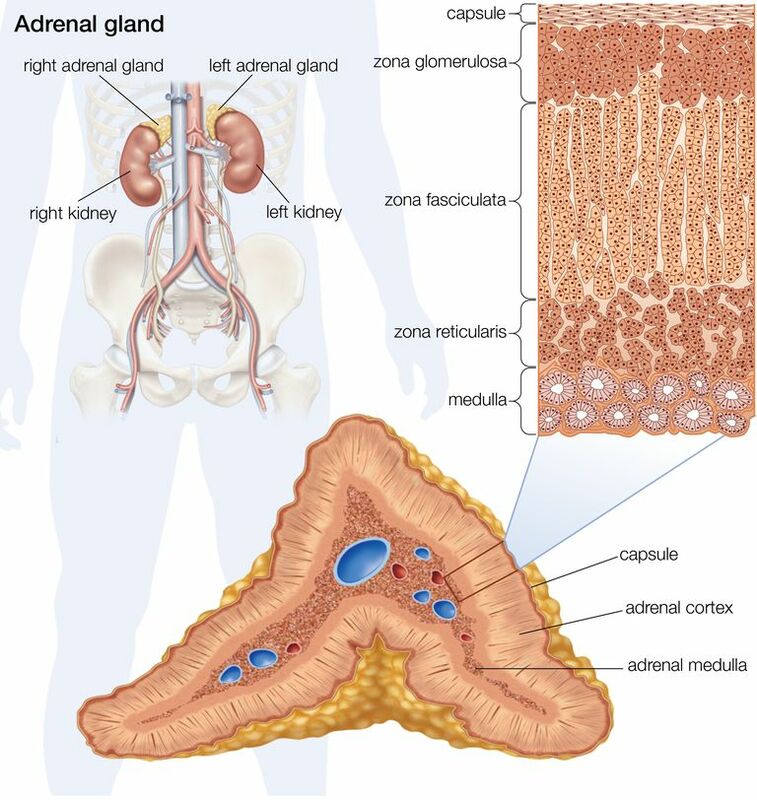 The inner area of the adrenal glands is known as the medulla and produces the hormones norepinephrine and epinephrine. When the adrenal glands produce too much or too little of a hormone, illness can result. Different types of adrenal disorders include Cushing's syndrome and Addison's disease. The hormones released by the outer part of the adrenal glands help control things like the immune system and metabolism. The hormones released by the inner cortex control the body's stress response and is often referred to as the fight or flight response. When faced with a threat, the body releases stress hormones that prepare the body to either stay and deal with the problem ("fight") or avoid the issue ("flight"). Have you ever been in a situation where you were very frightened? Your heart rate and breathing probably quickened as you became tensed and ready to take action. That is the body's response to the stress hormone epinephrine. By putting your body on high alert, you are better prepared to take action or run from the threat if necessary. Also Known As: Suprarenal glands, "Kidney hats"